Even though this spring's hottest denim trend is pastel colored denim, I still plan on getting plenty of use out of my cobalt skinnies. I snagged a pair during an after Christmas sale for under $30. I especially love them when paired with other bright and unexpected colors. Save 15% on some AE cobalt jeans for yourself by using coupon code 60255011 at checkout. 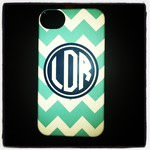 Or buy 3 or more items (stock up for the warmer months) and get 30% off your entire order. No coupon code needed for the 30% offer. Here's to hoping Monday flies by! See part 1 of Insta-Linds here! It's finally Friday! I have had THE busiest week and am very much looking forward to a well-earned glass of sav blanc tonight. I hope everyone has a wonderful weekend. See you Monday! Scenario: Your friends throw a house party together last minute and ask you to bring an appetizer to share. You don't have much time to whip up something fabulous and you don't want to skimp and bring chips and dip. So what's a girl to do? My first tip is to always have these ingredients on hand. It's the perfect go-to recipe for Friday nights at home in front of the TV, or aforementioned "in a pinch" situations. Preheat oven to 450F. Spread pesto over pizza crust. Add chicken to cover pesto evenly. Drizzle Alfredo sauce over chicken and cover completely with shredded cheese. Bake directly on the oven rack for 8-10 minutes or until cheese starts to brown. This is the easiest and yummiest pizza recipe you will ever try, I promise! What are some of your favorite quickie party recipes? This is also a guest blog for InWithSkin.com, see it here! I would love for you to follow L's Fashion Dish on Bloglovin'. It's also a great way to find other blogs you may never have heard of before. If you're on Bloglovin', leave me a link below and I'll be sure to follow you too! This is one of my favorite weekday recipes because it tastes like you're treating yourself to something not-so-healthy but in reality, you're behaving like a perfect angel. It also combines two of my absolute favorite flavor combinations -- sweet & salty. Marinate steak in teriyaki sauce for at least 30 minutes. The longer you let it marinate, though, the better. Broil for 8-10 minutes, flipping half way through. 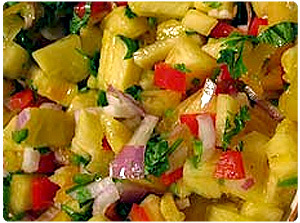 Chop pineapple, pepper and onions into bite-size pieces and add to large bowl. Chop cilantro and add to mixture. Squeeze fresh lime juice and season with salt and pepper to taste. Rinse and dry lettuce. Baste cooked steak with extra teriyaki and sprinkle with garlic sesame seeds. 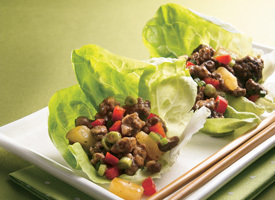 Build lettuce wraps by using one large leaf as base of wrap. I know we're barely through January, but now that winter has officially arrived in New England, I'm already daydreaming about sundresses and sandals. It's the only thing that gets me through the cold and the snow! Below is a list of my favorite spring/summer items that my closet is dying to own. From polka dots to pastels, this is how I plan to showcase the season's hottest trends. 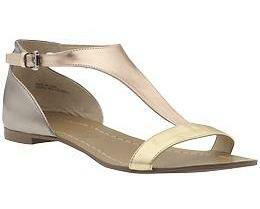 I adore these Boutique 9 Piraya sandals from Piperlime. 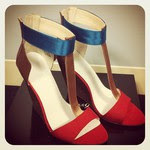 They incorporate two trends I can't wait to wear this spring -- metallics and colorblocking. As previously stated in this post, I'm a total sucker for anything peplum. It's so girly and flirty and not to mention totally flattering on any body shape. What's not to love? This shirt from ASOS is the perfect shade of cobalt and the pleating around the neck makes it more interesting. Okay, confession for you: I loved this dress so much that I already own it. But it was at the very top of my spring wish list so I can still include it here, right? I'm one of Michael Kors' biggest fans and this dress is absolute perfection in my eyes. 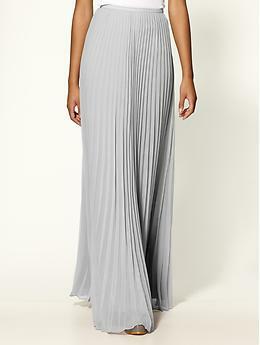 Cute, comfortable, and perfect for day to night dressing, I can't wait for the warmer weather so I can wear it. Oh, forget waiting. I'll just pair it with tights and a cardi now. Love versatile clothing like this dress! I LOVE these shorts so much that I had to include two polka dot items. I WILL own these Elizabeth & James Pin Dot Willie Shorts by the time spring arrives. I'm super psyched that pastel demin is taking the fashion world by storm. Sure, you might look slightly reminiscent of an Easter egg, but you'll also look effortless and cool. I love this neon persimmon pair from J.Crew. There's nothing better than a classic button-down shirt in a fun print. During the colder months, I go for plaids. Spring and summer months are meant for flowers and bright colors. 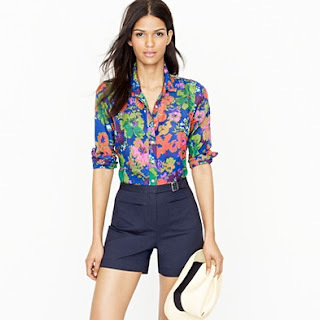 This Ashbury Floral shirt from J.Crew incorporates both! 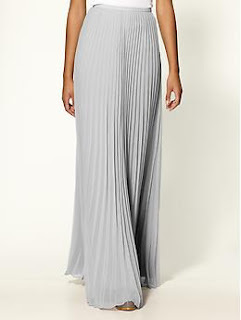 This Halston Heritage skirt is so gorgeous that it can be paired with something simple like a white t-shirt and you'll still look glamorous and pulled together. I've been searching for cat eye glasses for years and finally found a pair that suites me. I think overly-emphasized cat eye glasses look great on others, but unfrotunately not on me. The Kate Spade Rory glasses are ever so slightly cat-eyed and will be the perfect addition to any summer ensemble. I'm loving anything bright and unexpected right now (remember this post?) 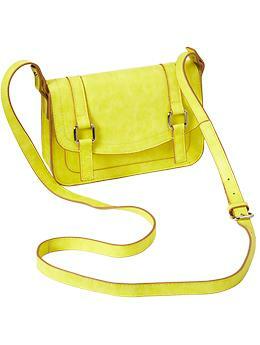 And this Old Navy Messenger Bag is perfect for those who are neon-obsessed. And hello, it's $17! We've all heard it before -- breakfast is the most important meal of the day! It's is responsible for jumpstarting your metabolism and giving you energy to do the million and one tasks we all have to finish each day. But why is it so hard to sit down and eat a healthy, balanced meal before we head out the door? For a long time, my breakfast consisted of a protein bar and a cup of coffee. It just wasn't satisfying though. I needed something yummier. But still quick. And cheap. Add contents of oatmeal package + water to a microwave safe bowl. Heat for 1-2 minutes. 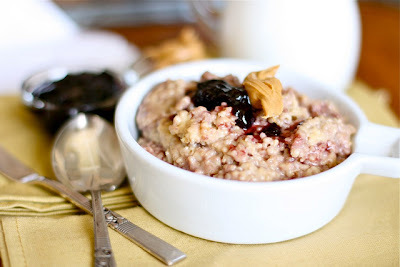 Stir in peanut butter and jelly and enjoy! This recipe has only 245 calories per serving and will keep you full and energized well into the afternoon. And who doesn't love the combination of peanut butter and jelly? This is a guest blog for InWithSkin.com, an online skincare, health & beauty magazine. You can see the post here. I've been on the hunt for a bright pink blazer for some time now. I was really lusting after this Preen version but since I don't have $1700 to spend on a trend like this, I opted for this cute Forever21 one instead. I originally wanted a pink blazer to pair with a white sundress come summertime, but now that I own one, I totally think it works for any season. I love how each celebrity below styled hers. I will definitely be using these photos for inspiration going forward! I decided to pair my pop of pink with a simple, classic outfit. Add a fun necklace, my trusty MK watch, some bangles, and there you have it. Perfect for work or play! You could also have some more fun with this by throwing it over some cobalt jeans for the whole colorblocking look. Or how about a navy & white striped tee underneath for something more casual? The point is to have fun with a piece like this! It's baffling to me that I've eaten at this restaurant easily 10 times and I am just now writing a review. If you like good, down-home, stick to your ribs (pun intended) barbecue, this is your place. I'll admit, I'm not a BBQ connoisseur and I wasn't born and bred in the south so I go strictly off of what tastes good to me and what makes me do a little happy dance in my chair. Anyone else do a dance when their tummies are content? No? Okay moving on. It was at Redbones that I was first introduced to fried pickles. These come to your table piping hot and just begging to be gobbled up. Cue salivation. They're served with something reminiscent of a ranch dressing... but so much better. I rarely step out of my comfort zone when it comes to my main dish because I'm not the biggest fan of pork and I don't particularly care for ribs. They must both be delicious though because my boyfriend and his mother refuse to order anything else. I personally have a love affair with their pulled BBQ chicken. Perfectly saucy and delicious. Call me boring but try it once and you'll understand. Other notable side dishes were the mac and cheese (recipe here), the cornbread, the corn fritters served with real maple syrup, and the potato salad. These are not to be downplayed because I didn't go into detail about each and every one of them. I promise you will not be disappointed with anything you have there. And they serve lemonade and sweet tea in mason jars. How fun is that? Sadly I've never tried any of the desserts at Redbones because I've always been too full. And for someone who is a dessert fanatic, that's saying something about their food. But they have choices such as pecan pie, key lime pie and a white trash sundae. Your guess is as good as mine as to what exactly a white trash sundae is. The decor is that of a hole in the wall bar. The wall is sprinkled with colorful murals, t-shirts, old school photos, etc. It's totally understated but comfortable and exactly what a BBQ place should be. It's a very affordable lunch or dinner spot and prices range from $2-$9 for appetizers, around $10 for sandwich (served beans and potato salad! ), and around $20 for entree combos. Service has always been fast and friendly any time I've gone. 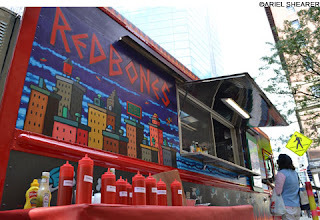 Redbones is located at 55 Chester Street, Davis Square, in Somerville, MA. They have a full catering service as well as a food truck that visits downtown Boston during the spring/summer months. I recommend this restaurant to anybody who likes to enjoy great food in a relaxed atmosphere without spending a ton of dough. So there you have it -- five completely different ways of styling one dress. For those of you who tend to buy something and only wear it one or two times, I encourage you to try some of these looks with your own dresses! Now that you've seen all five of my looks, which one do you like best?﻿ Would you have styled it differently? If so, please leave a comment below. I love hearing your ideas! For those of you who have a long weekend coming up, enjoy!